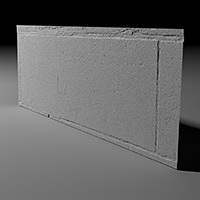 Differential surface scans from parts of the external and internal walls of Nidaros Cathedral (Trondheim, Norway) and a pillar from the Elefsis archaeological site (Elefsis, Greece). The scans were taken in April 2013, September 2014 and November 2015. These can be used for the study of erosion under realistic conditions and can serve as a point of reference for the future. You can download the dataset from: http://files.idi.ntnu.no/presious/PRESIOUS_Original_Data/ (directories /CulturalHeritageObjects* ). Please contact theotheo@idi.ntnu.no for access credentials. Multimodal scans of marble and soapstone slabs across 2+ accelerated erosion cycles (number of cycles depends on erosion chamber). The slabs were subjected to accelerated erosion in erosion chambers simulating H2SO4 and H2SO4+HNO3 acid pollution, freeze-thaw and salt effects. 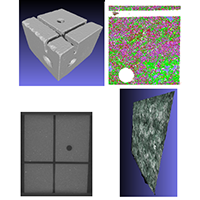 The measuring modalities are high accuracy geometric surface scans, QEM mineral scans, computed tomography and 3D microscopy. 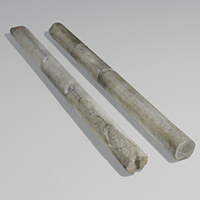 These can be used for the study of erosion on stone. You can download the dataset from: http://files.idi.ntnu.no/presious/PRESIOUS_Original_Data/ (directories /StoneCollection*). Please contact theotheo@idi.ntnu.no for access credentials. A 5mm resolution version of a high-detail (sub-millimetre) scan of an eroding surface on the northern exterior wall (Lectorium) of Nidaros Cathedral in Trondheim, Norway. It is the second of a series of differential scans taken for WP3. A 5mm resolution version of a high-detail (sub-millimetre) scan of an eroding surface on the northern exterior wall of Nidaros Cathedral in Trondheim, Norway. It is the second of a series of differential scans taken for WP3. 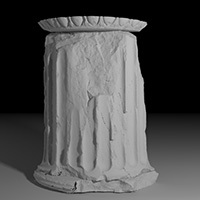 This is a 3mm resolution version of a high-detail (sub-millimetre) scan of an eroding column at the archaeological site of Elefsis, Greece. It is the second of a series of differential scans taken for WP3. A 5mm resolution version of a high-detail (sub-millimetre) scan of an eroding surface on the northern exterior wall ofNidaros Cathedral in Trondheim, Norway. It is the first of a series of differential scans taken for WP3. A 5mm resolution version of a high-detail (sub-millimetre) scan of an eroding surface on the northern exterior wall of Nidaros Cathedral in Trondheim, Norway. It is the first of a series of differential scans taken for WP3. 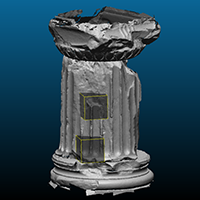 This is a 2mm resolution version of a high-detail (sub-millimetre) scan of an eroding column at the archaeological site of Elefsis, Greece. It is the first of a series of differential scans taken for WP3. 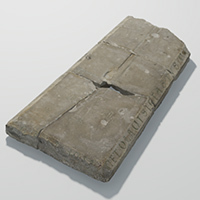 This is a 5-piece collection of 3D scanned fragments of a tombstone from the Nidaros Cathedral Crypt. The archive also contains a reassembled version of the low-resolution version of the pieces. 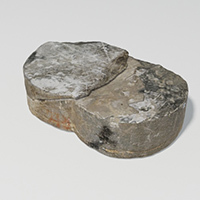 A 3-piece collection of fragments from a decorative stone block from the Nidaros Cathedral. All pieces can be reassembled into a single cluster. The archive also includes a manually reassembled low-resolution version of the pieces. 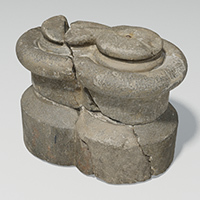 This is a two-piece set of a fragmented column foundation from the Nidaros Cathedral in Trondheim, Norway. 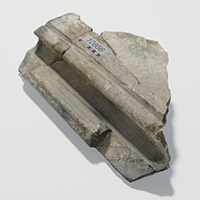 The fragments were scanned at the Dora storage facility of the Nidaros Cathedral Restoration Workshop during April 2013. 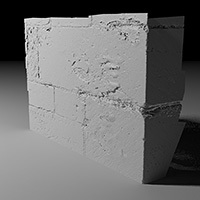 The model archive also contains a low-resolution reassembled version of the foundation. 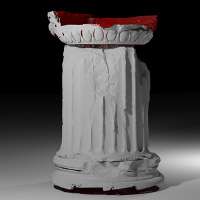 This is a 5-piece fragmented column base from the Nidaros Cathedral. 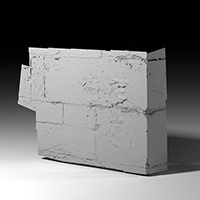 The model archive also includes a low-resolution version of the manually reasembled pieces. This is a set of 6 fragments belonging to 2 ornamental column seghments from an entrance to the Nidaros Cathedral. The archive also includes a manually reassembled low-resolution version of the embrasure, as shown in the image. 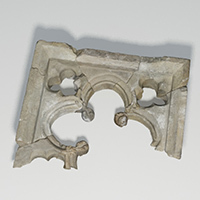 A 12-piece collection of fragments from a decorative embrasure from the Nidaros Cathedral. 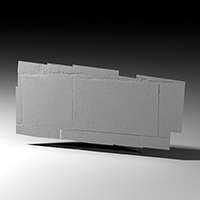 All pieces can be reassembled into a single cluster to form the partial embrasure frame. The archive also includes a manually reassembled low-resolution version of the embrasure. This is a 30-piece set of a fragmented arch from the Nidaros Cathedral in Trondheim, Norway. 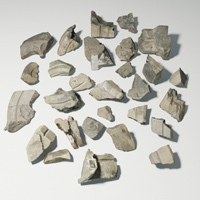 The fragments were scanned at the Dora storage facility of the Nidaros Cathedral Restoration Workshop during March 2013. Among the 30 pieces, we were able to identify two pairs of matching fragments.